In Ancient Rome, the village in-house doctors were referred to as "Casa Medici". The traditions of family medicine which were handed down from generation to generation by these doctors evolved into a virtual treasure trove of medical knowledge. History is littered with references to the healing prowess of these ancient physicians, many of whom created the foundations of modern medicine. These ancient roman doctors or "Medici" laid emphasis on "the art of practicing good medicine by combining the science of medicine with the virtues of compassion and individual care". "Compassion" literally translates from Latin as "to suffer together". "Patient", again from Latin, means "the suffering or sick person". Linking these two words - the person offering compassion is offering to share in the sick person's suffering " that is the basis of good medical practice. Drawing inspiration from the past and present of Italian culture, the cradle of Western civilization, we bring to you a medical facility that practices the "art" and not just the "science" of good medicine. Welcome to Medicasa, our House of Medicine. 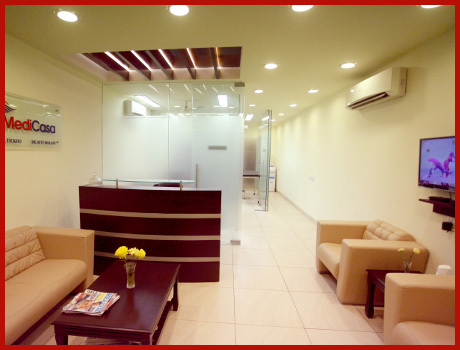 From a warm greeting at the front desk, to a short waiting time in a neat and elegant ambience, you are directed to a set of doctors who are eager to listen, to counsel and not just consult. We believe that what a patient needs is a caring and compassionate audience of doctors who do not hesitate to spend that extra bit of time and energy over every individual who walks into the clinic as a patient. This personalized healthcare service is what we aim to achieve - one that combines accurate clinical diagnosis and prompt treatment with individual care. In the spirit of the medical practitioners of yore, whose strengths lay in their empathy, their patience and their learning, we bring to you our House of Medicine, which remains intrinsically modern while still maintains the traditional foundation of medicine, to care, to heal and to cure.